Sake-kasu is the leftovers during making Japanese Sake. It can be bought all the year, but fresh one comes to market in winter because it’s the season of latest Sake of the year (called Shinshu). Especially, from around the end of February to the mid of March, we can find it well at the supermarkets. March 3rd is Hinamatsuri day to celebrate girls’ growing and we have a custom to drink “Amazake” made of Sake-kasu at that day. As you might know, Japanese Sake is made of rice and it is fermented. 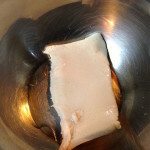 So Sake-kasu is also fermented food like Miso. I’ve already posted Miso marinated fish. Today, I would like to introduce Sake-kasu marinated fish. 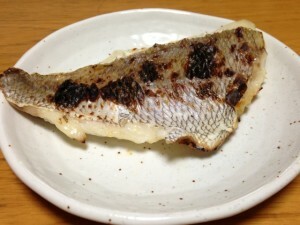 However I used Cod at this time, any other fish such as Sea Bream, Salmon or vegetables are often cooked as Kasu-zuke. 1) Sprinkle normal amount of salt to the Cod and leave for about 15 min. 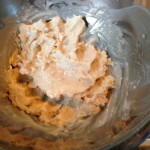 3) Place Sake-kasu in a bowl and add some warm water. Mix them until Sake-kasu becomes smooth. 4) Add cooking sake and then mix well until becomes smooth. 5) Add Mirin, then mix as same as step 4. Then add Sugar and mix, add salt and mix. 6) Wet gauze with water and squeeze it well. Then wrap the cod with the gauze. 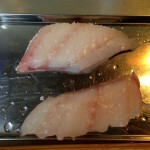 7) Place about 1/3 amount of Sake-kasu paste in a tray or box, then place the cod in the gauze. 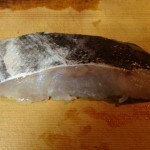 8) Add Sake-kasu paste to cover whole fish. 9) Place a lid and leave it in a fridge for about 1 week. 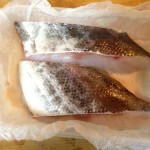 10) Pick out the cod and heat it slowly on middle or a little small heat on fish grill. When half of it is heated, flip over. 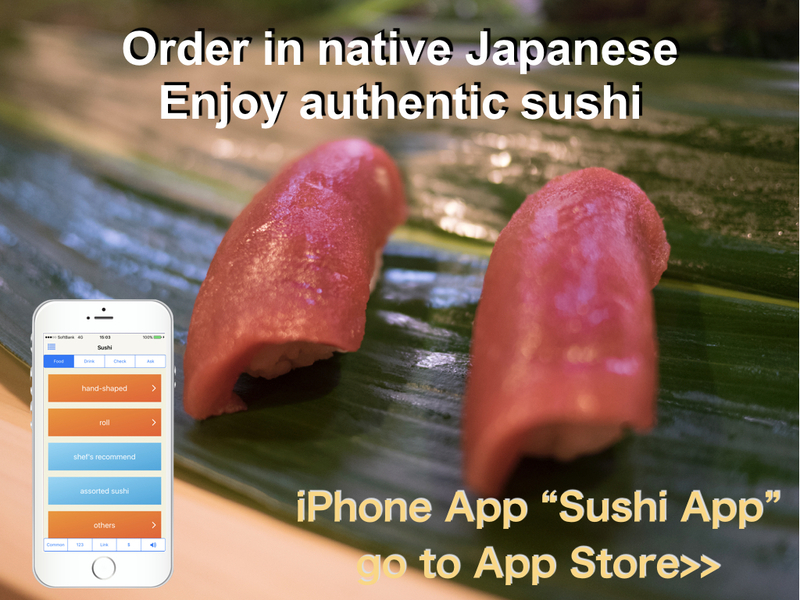 The fish is fermented with Sake-kasu for about 1 week, the moisture is removed and fish meat becomes tighten. With this state, extra moisture is gone and only “umami” is remained. This is an effect as same as Miso Zuke (miso marinated). The taste is faintly sweet and feel some smell of Japanese Sake. Miso includes a salt and Miso Zuke tastes a little salty. This is the different point between Kasu Zuke and Miso Zuke. 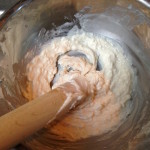 Sake-kasu paste can be reused twice or 3 times. 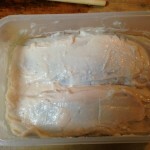 I marinated Sea Bream after Cod. It is also very good. This cooking method, Kasu Zuke, is shown in a book published in A.D. 905. So it has more than 1200 years history. I think it was the effort to preserve foods longer. Now we have a fridge and can keep foods longer. But Kasu-Zuke brings another experience of foods. 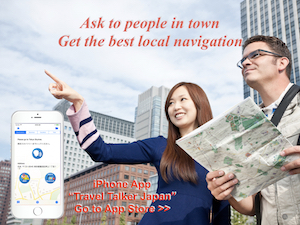 It may be difficult to buy Sakekasu out of Japan. But there are some places making Japanese Sake even out of Japan. Sakekasu should be there. However this method takes about 1 week, I think it is the worth to try.